Inspired by Eliza’s post, I set off with Miss E, Master R and Little Miss M to record our walk yesterday, a glorious October morning. This Autumn is truly deliciously spectacular. Little Miss M reminded me to put Strava on so that we could record our distance to add to our target of 500 miles. This is one of our favourite walks and we have been doing it since they were all babies, but it has been a long time since we were here …. ….. imagine their delight when they spied the river and remembered the swing! walks are never dull with this lot! But we had to cover some ground if Little Miss M and I are going to reach our goal – onward. is this one a camel? It looked the perfect home for an evil elf! Here we sat for a drink and a snack. We all thought of three words each to describe our walk so far, and as we walked on the children composed little poems using the words – it all got very giggly as they created weird and wonderful rhymes. I was hoping it would end and we would come out on clear path so we battled on for quite a way getting stabbed with prickles and feeling like badgers in the undergrowth. We sent Master R ahead to see if there was light at the end of the tunnel – but no – we had to turn back and make our way back the way we had come. 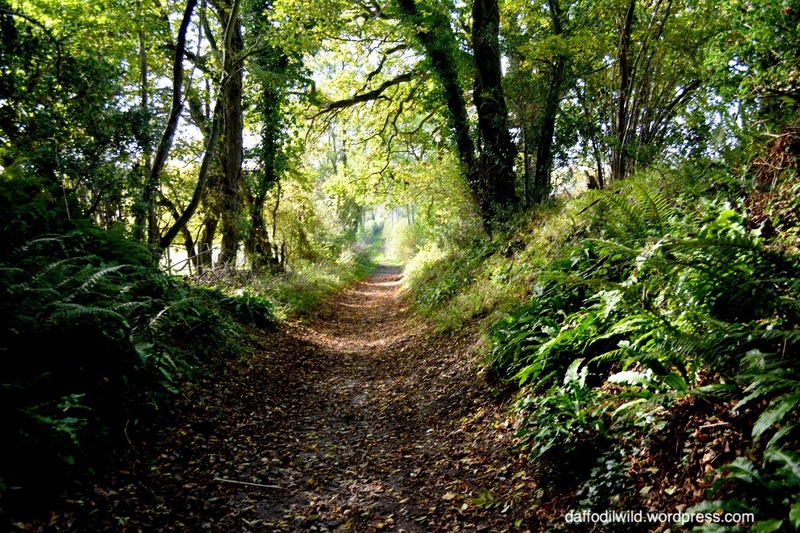 Oh the joy of autumn sunshine through trees and walking the sunken lanes. Back to the car and Little Miss M and I checked Strava. We had added 2.4 miles to our total. We have now done 54 miles – only 446 to go! I hope you enjoyed scampering along with us. 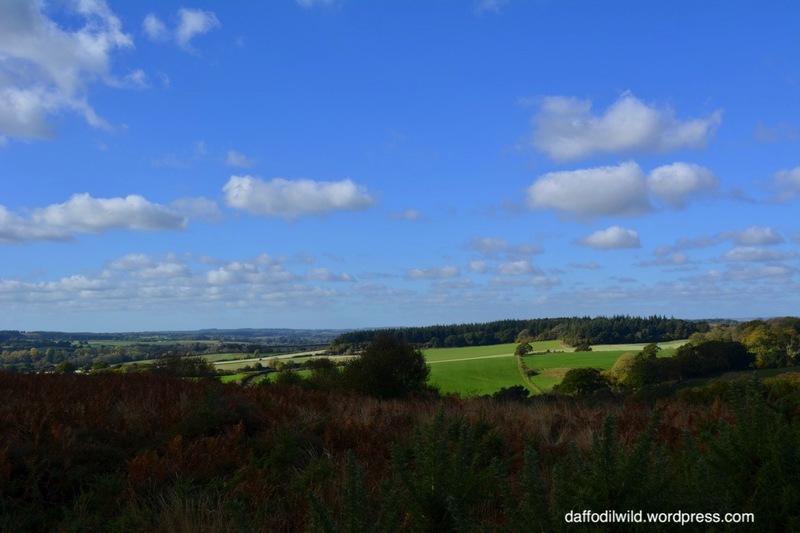 This entry was posted in walks and tagged 500 miles, fly agaric, fungi, trees, views, walk, Walktober. Bookmark the permalink. Wonderful walk, thanks for sharing, and the swing over the water… That looked especially inviting, I could have stayed there with you all for ages too. 😀 Pity about the gorse making you turn back, it would be fun to visit again with a pair or two of secateurs in your pocket to carve your way through, I don’t think Ma Nature would mind a little trim here and there. Great minds … Sallyann, but I think I’ll need huge loppers or a mechanical strimmer! I’m going to try the walk from the other direction one day to see how far the gorse jungle stretches. So glad you enjoyed our adventures. I LOVED scampering along with you. Especially loved that photo that looks like the kids are in a tree tunnel! What a wonderful walk, Sandra. And that “hare” or “llama” – what a wonderful discovery. 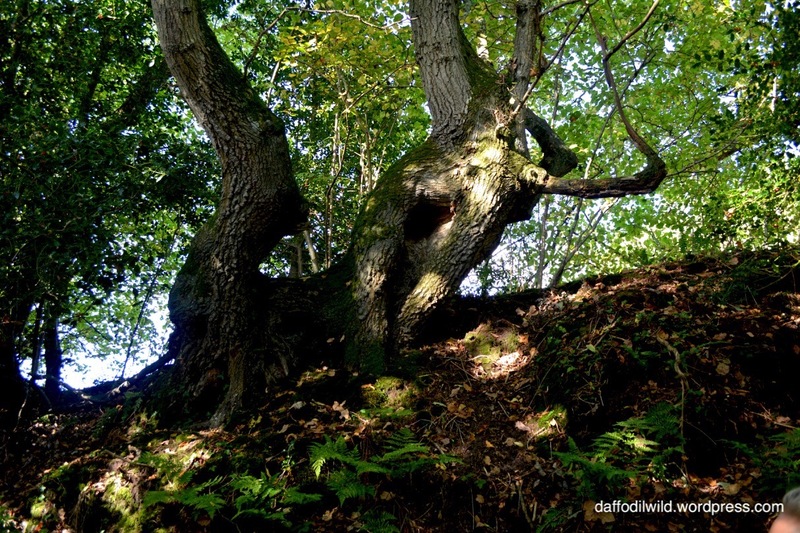 Thank you for sharing your Walktober with us. A real pleasure Dawn. So glad you could scamper along with us. i’ve loved seeing all the Walktober walks. As our surname is “Larmar”, pronounced “Llama”, you can guess what I think the tree looks like! Such wonderful photos of the English countryside – reminds me why I could never live abroad. Ah yes! a Llama! it does! I know what you mean about the English countryside, it’s in our bones isn’t it – although I did fall in love with Australia when I was there for a month 20 odd years ago and would have stayed there if I had not 3 children to go home to! What a wonderful ramble on such a glorious day! I truly envy you your sunken lanes and holloways – we have nothing like that here! I’m glad you found the mushrooms – aren’t those Fly Agaric just the quintessential fairytale mushroom? Thank you for bringing us along. Yes those red with white spotted shrooms do feature in fairy tales don’t they. They look quite exotic in our otherwise rather bland UK colour palette. Looks like a lovely walk with such fun company. Fly algaric isn’t that the fungi that are called magic mushrooms and I have a vague memory were favoured by witches? Fly Agaric are the homes of fairies! (Over from Robin’s) Thanks for sharing the variety in while walking the English countryside. The little ones sure seem to be enjoying themselves. Cheers to that! Thanks for participating. Thanks so much for popping by Frank. Loving Walktober! 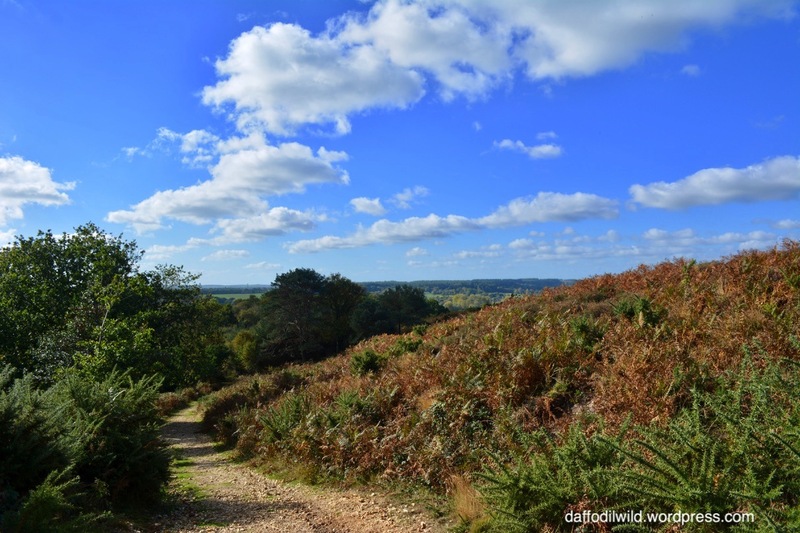 Thanks so much for the link – a truly spectacular walk! 🙂 … thanks for coming over. It really was superb, really glad you enjoyed the post Eliza. I’m so glad you enjoyed it. Walktober is such a good idea. I am always amazed at the romantic lovely walks in your country. I have never thought about camels and rabbits looking something alike. They certainly do in this context. Happy day. Now you come to mention it, neither had I Lisa. Having never been to England, I always imagine that scenes/views like your photo where you stopped for a snack and drink, must be exactly what all British people savor! (besides the Sea!) Am I right? Is it not “the” view of your Country? Just like the Highlands are Scotland and the Mountains are Wales? Well that’s what I image :o) And I thank my relatives for leaving all that beauty to come here! It must have been incredibly hard! You are right Eliz – well for this Brit anyway. Maybe some people who live in the cities feel differently, but I truly adore every hill, vale, river and yes, coastline too. I love the majesty of Scotland, but find it too harsh to be there for long. Being half Welsh I also love any bit of Wales, but my Mum came from the coast so it is the coastline of Wales where I find peace and happiness. Do you know which part of the British Isles your ancestors came from? I thought a hare too. That was a good walk – with lots of fun on the way. 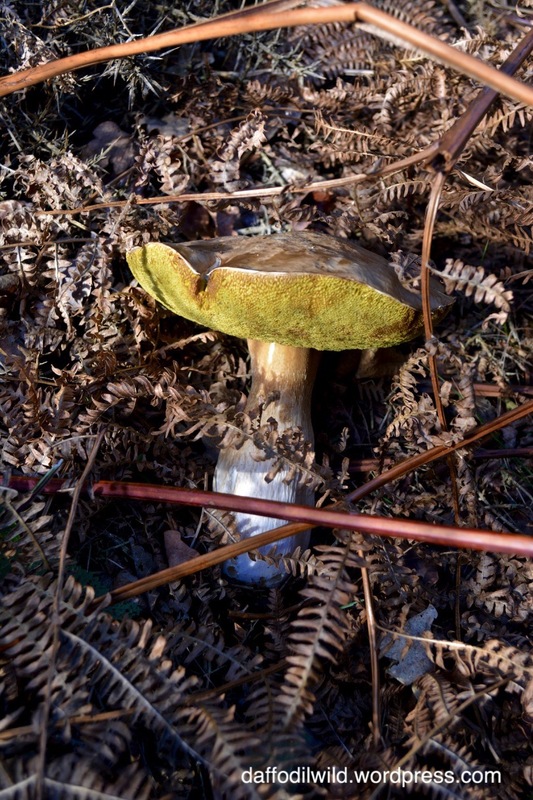 I saw a hare – Miss E saw a camel – Master R was too busy searching for fungi, the more poisonous and slimy the better! I loved your walk, thank you. So are you knitting the evil elf? PS I see a donkey! A lovely time you all had – autumn walks are the best.